The cholera outbreaks of the 1830s and 1840s forced the government to make drastic improvements to the methods of drainage and sewage disposal in London. A Metropolitan Commission of Sewers was charged with the central task of unifying the existing piecemeal drainage system and forming a plan for a completely new one. A new map showing the levels of the land to be drained was needed for this. In March 1848, officers of the Royal Engineers began to prepare stations for triangulation. Observation posts were set up on one of the towers of Westminster Abbey and over the cross of St Paul's. 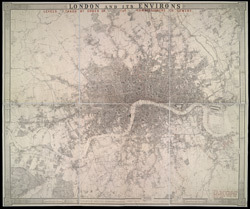 This map is the result of the survey, showing the relative altitude of the land, a necessary preamble to planning drainage systems, as sewage can only be washed away downhill.